will be to guess the outline, the shape, the quality of the answer." Inside the Earth With the advent of the Hubble Space Telescope and an array of remarkably capable instruments to look outward into space, we are learning more and more about the planets, our Galaxy, and other astronomical objects, some many billions of light-years away. But our knowledge of the Earth we live on, and what lies inside it, is still very limited compared to these astronomical discoveries. This may be because we do not have the equivalent of modern telescopes to look inside the Earth, we lack instruments with which to discover Earth's secrets. So the facts, data analysis, and conclusions and opinions we have obtained so far are still at a much lower level of certainty. In this article we'll look at the tools and techniques which are currently available to us, and describe the picture or pictures of the Earth which these methods and measurements suggest. But it must be acknowledged that these pictures are based on much weaker and scarcer evidence than is available for the Universe outside the Earth, and many current assertions are really rather speculative. First we'll look at all the various lines of evidence which do exist, and try to put together a new picture of the interior of the Earth and its workings, as a scientific model. We'll call this model the Heartfire Model of the Earth. As with all good scientific models, the aim is to erect a structure which gives the best correspondence between observed data and a theoretical set of rules and laws which are suggested to underlie the data. As newer information is gained, the model may need modifying to accommodate this, and perhaps eventually may need replacing completely with a better one. But it gives a starting point, and very importantly, allows us to massage the model to generate predictions about things which may be then tested, and in so doing, see how good the model actually is. It doesn't matter whether the model is 'true' or 'real' or not, all that matters is whether it is self-consistent and gives the best match with the data. This is a useful approach, because it allows critics to suggest improvements to bits of the model, to make it better reflect new data. The Earth as a sphere The Earth is a solid spherical object, with a circumference very close to 40,000 kilometres (this round figure is not a coincidence, it is because the metre was defined as one ten-millionth of the distance from the pole to the equator). It is not an exact sphere, because rotational forces make it bulge at the equator, but it is close enough to spherical for our purposes here. All the evidence shows that the Earth is made up of layers, layers which abruptly change in nature as you go down from the surface to the centre. Figure ITE1. Diagram of layers within the Earth. From . The top, surface, layer, called the Crust, is very thin compared to the others -- averaging about 30 km, compared to thousands of kilometres for the others. It is also the least dense, at around 2.7-2.9 (gm /cm3). The Crust is the only one of Earth's layers that we have gained direct physical access to. The deepest core-recovery borehole ever to date, the Kola Superdeep Borehole , was drilled in the Soviet Union's Kola Peninsular, starting in May 1970, and the work was stopped at 12.26 km in 1989, although the original depth target was 15 km. Figure ITE2. Headworks building above the Kola Superdeep Borehole. From . Results from the Kola borehole had many surprises, concerning the nature of the rock cores recovered, borehole temperatures, universal presence of water and hydrogen at depth, and depths at which rock types changed as predicted by seismic (earthquake wave) studies. Here is an extract from the Wikipedia article  which mentions some of these unexpected results. "The initial target depth was set at 15,000 m. On 6 June 1979, the world depth record held by the Bertha Rogers hole in Washita County, Oklahoma, at 9,583 m was broken. In 1983, the drill passed 12,000 m, and drilling was stopped for about a year to celebrate the event. The hole reached 12,262 m in 1989. In that year the hole depth was expected to reach 13,500 m by the end of 1990 and 15,000 m by 1993. However, due to higher than expected temperatures at this depth and location, 180 deg C instead of expected 100 deg C, drilling deeper was deemed unfeasible and the drilling was stopped in 1992. With the expected further increase in temperature with increasing depth, drilling to 15,000 m would have meant working at a projected 300 deg C, at which temperature the drill bit would no longer work. The Kola borehole penetrated about a third of the way through the Baltic continental crust, estimated to be around 35 kilometres deep, reaching rocks of Archaean age (greater than 2.5 billion years old) at the bottom. 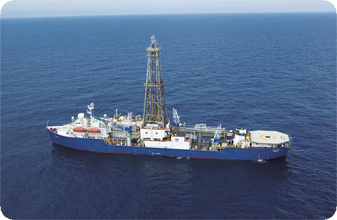 The project has been a site of extensive geophysical studies. The stated areas of study were the deep structure of the Baltic Shield; seismic discontinuities and the thermal regime in the Earth's crust; the physical and chemical composition of the deep crust and the transition from upper to lower crust; lithospheric geophysics; and to create and develop technologies for deep geophysical study. To scientists, one of the more fascinating findings to emerge from this well is that the change in seismic velocities was not found at a boundary marking Harold Jeffreys's hypothetical transition from granite to basalt; it was at the bottom of a layer of metamorphic rock that extended from about 5 to 10 kilometers beneath the surface. The rock there had been thoroughly fractured and was saturated with water, which was surprising. This water, unlike surface water, must have come from deep-crust minerals and had been unable to reach the surface because of a layer of impermeable rock. Another unexpected discovery was the large quantity of hydrogen gas, with the mud flowing out of the hole described as "boiling" with hydrogen." The question might be asked, "How much did these surprising discoveries change the views of geologists and geophysicists on how the Earth is made up?" The answer is itself surprising -- "Not at all". Here is just one indication that conventional ideas in this area are shaky and unsettled. We will encounter others. 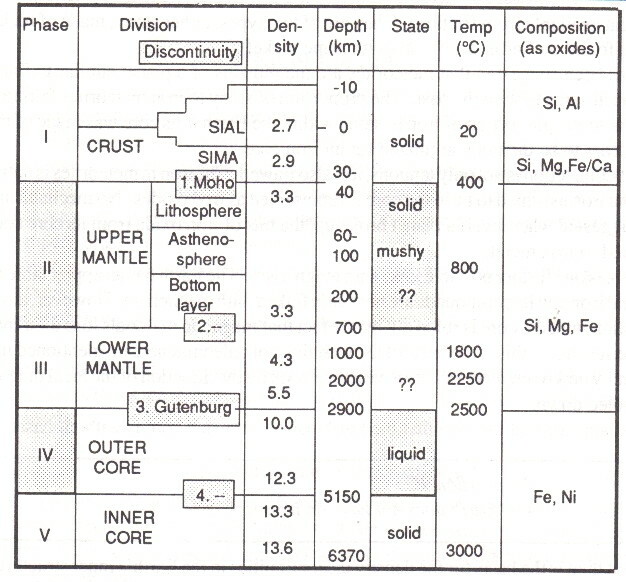 In the table which follows as Figure ITE3, current conventional values for density, physical state, temperature, and chemical composition of the Earth's layers are summarized. It has to be emphasized that most of the values given are only theoretically derived, and not measured. We shall see that some of these values fit in with the Heartfire Model proposed here, and some do not. Fig. ITE3. Traditional view of properties of layers of the Earth from surface to centre. From . The Crust, the uppermost layer of the planet, is about 30-40 km thick, and has an average density of about 2.7 to 2.9 (gm / cm3 ). It is usually divided into two parts, the SIAL and the SIMA, which differ in their chemical composition. Essentially, the SIAL is an incomplete layer, representing the rocks of the continents. These rocks have high proportions of Silica (Si) and Aluminium (Al) in their makeup, and are of three types which have been re-worked during their histories. Sedimentary rocks are ones which have been broken up by water or wind erosion and re-compacted elsewhere, such as on a seabed. Igneous rocks are ones which have been re-melted by friction or other heat source. And metamorphic rocks are produced by the action of pressure and heat on either of the other types. The SIMA layer, unlike the SIAL, is believed to form a complete layer over the Earth. So it underlies the SIAL rocks of the continents, and forms the base of the seabeds where there is no continental rock. These lower layers of the crust contain more calcium, iron, and magnesium than the higher layers, and are often classified as 'basalt' rocks. Remember that the deepest core samples produced to date were from the 12.26 km Kola borehole, which was entirely within the SIAL continental rocks. Producing rock cores from holes drilled in the beds of the deeper oceans is technically challenging, and such drill-holes have reached only around 2 km below the seabed. The drills may have to operate in water up to 6 km deep. Nevertheless, special deep-sea drill ships, starting in 1968 with the 'Glomar Challenger', and followed more recently by the 'Joides Resolution'  and the 'Chikyu', have produced very valuable and sometimes surprising results. Fig. ITE4. The Joides Resolution deep-sea drilling vessel. The drill operates in a well in the centre of the ship. From . Most deep-sea cores, after a fairly thin layer of sediment, reach basaltic rock. 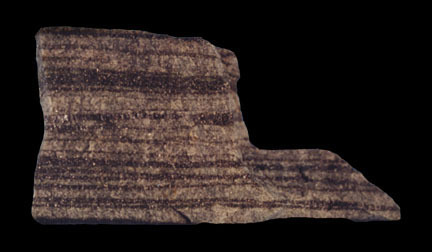 This rock is of a special type, called MORB (from Mid-Ocean Ridge Basalt). Surprisingly, its composition is practically uniform over all the deep ocean beds. Why should this deep-ocean rock be everywhere the same? Why should it be seen in some places on the crust, while other places show continental rocks of varied types? Older science had little enlightenment on this matter, but with increasing acceptance of the Expanding Earth model, the situation is clearer, and the Heartfire Model will take us a step further still. Expansion of the Earth The idea that the Earth might have expanded during its long history was suggested as early as 1859 in a book by Alfred Drayson. This book, "The Earth We Inhabit: Its Past, Present, And Probable Future", followed only one year after another important book, written by Antonio Snider-Pellegrini, which laid the foundation for the concept of Continental Drift. Then, in 1915, Alfred Wegener wrote a book which gave strong support to the Continental Drift concept. But public acceptance didn't become common until Sir Edward Bullard published his computer-based analysis of continental margins in 1964. Those wanting further detail will find it in "Nuteeriat" . Also in the 1960s, when sea-floor drilling results became available from the 'Glomar Challenger', the ground-breaking discovery was made of Sea-Floor Spreading and the Mid-Ocean Ridges. It was found that all the major oceans held linked giant fissures, great slots in the ocean floors from which molten rock issue forth to create new sea-floor on either side of the fissures. Fig. ITE5. Location of Mid-Ocean Ridges. From . Over the following years, some 20,000 seabed drill cores were recovered, and these revealed an amazing picture. All of the deep ocean beds had been formed within the last 200 million years (for comparison, Earth is some 4600 million years old), by the continuous production and spreading of new basalt (MORB) from these fissures. All the new data made it possible to date the times of formation of all the deep-ocean beds. The oldest portions, around 180 million years old, were mostly at present-day continental margins. Then there was a continuous transition, with the rock getting younger and younger, towards the present-day Mid-Ocean Ridges, where new sea-bed (age zero years), is currently being produced. Fig. ITE6. Age patterns of the Earth's ocean beds. From . Of course the only possible explanation for this detailed pattern of when sea-floor was being produced was that the Earth has been regularly expanding for the last 180 million years. The process is still continuing, there is even a YouTube video available of new, red-hot MORB basalt lava being produced at one of the Mid-Ocean Ridges . The sea-floor spreading data not only explains very satisfactorily why Continental Drift occurs, it gives complete detail on when and how the continental crust was split apart. For example, it shows how the first rift between what's now the eastern USA and the northwest coast of Africa created a long north-south depression about 180 million years ago. This widened gradually over the next 50 million years, until around 130 million years ago the split extended down the entire Europe/Africa and North/South America regions. So Continental Drift is no longer in doubt. But we still lack a good explanation of the factors which are causing the Earth to expand. For this, we will need to look deeper within the Earth. Understanding what goes on under the Crust The brilliant results set out above have been obtained using traditional methods of rock analysis. These methods apply to materials which we can hold in our hands and subject to chemical and physical analysis. To go deeper, beneath the Crust, we have to use quite different techniques which, although quite powerful, cannot give the same certainty in what we deduce from them. Easily the most powerful of these deep-Earth techniques is seismology, the study of earthquake waves. A large earthquake sends various waves right through and around the Earth. These are reflected and refracted (bent) as they encounter the abrupt density changes at layer boundaries, just as light waves are reflected and refracted at an air/glass boundary. Fig. ITE7. Paths of seismic waves from an Earthquake. From . Figure ITE7 illustrates how an earthquake (top of figure), with its centre below the surface, gives rise to various types of waves, marked P, S, PKP, Surface, and so on, which are variously refracted and reflected. The types of wave differ in the ways they are propagated. Here is an extract from the Wikipedia article on earthquake waves . Body waves -- Body waves travel through the interior of the Earth. They create raypaths refracted by the varying density and modulus (stiffness) of the Earth's interior. The density and modulus, in turn, vary according to temperature, composition, and phase. This effect is similar to the refraction of light waves. Primary waves -- Primary waves (P-waves) are compressional waves that are longitudinal in nature. P waves are pressure waves that travel faster than other waves through the earth to arrive at seismograph stations first hence the name "Primary". These waves can travel through any type of material, including fluids, and can travel at nearly twice the speed of S waves. Secondary waves -- Secondary waves (S-waves) are shear waves that are transverse in nature. These waves arrive at seismograph stations after the faster moving P waves during an earthquake and displace the ground perpendicular to the direction of propagation. Depending on the propagational direction, the wave can take on different surface characteristics; for example, in the case of horizontally polarized S waves, the ground moves alternately to one side and then the other. S waves can travel only through solids, as fluids (liquids and gases) do not support shear stresses. S waves are slower than P waves, and speeds are typically around 60% of that of P waves in any given material. So measurements of the same earthquake at different spots around the world let us trace the paths taken by the various waves to reach those spots. P-waves travel through solids and liquids, while S-waves do not pass through liquids. The refraction of all these waves depends on the densities of the materials through which they pass. 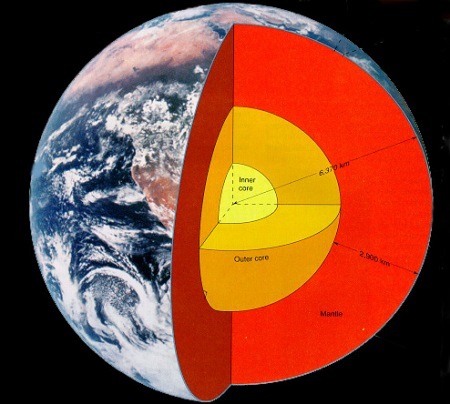 As shown in Figure ITE7, the results of seismic measurements define clearly the three main layers of the Earth -- the Mantle, the Outer Core, and the Inner Core. These three layers appear to differ fundamentally in nature. In the Heartfire Model, the Crust is only a modified part of the Mantle. 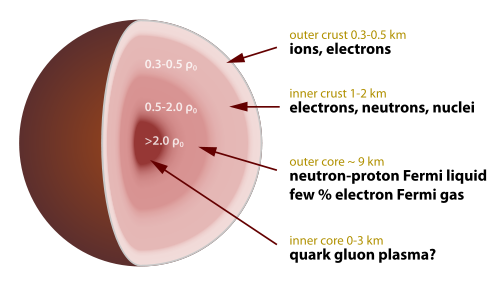 The term 'Outer Core' is misleading -- it means 'outer inner', and does not reflect its fundamentally different nature compared to the 'Inner Core'. In this model, the term used instead of 'Outer Core' is 'Mesolayer'. The term 'Core' will be limited to describing the former 'Inner Core'. Referring back to the Table in Figure ITE3, it can be seen that finer divisions may be made in some of these layers, such as between the Upper Mantle and the Lower Mantle. Again, in the Heartfire Model, these divisions, while nonetheless real, are not basic in nature. As an example, the whole of the Mantle may be made of the same material, but this may suffer a phase change (transition to a different method of packing its atoms) at the Upper/Lower boundary. The Mantle is essentially solid. The Mesolayer is usually stated to be liquid, and the Core to be solid. We will be rather less definite about this here, and say that the Mesolayer transmits earthquake waves as does a liquid, and the Core transmits earthquake waves as does a solid. Fig. ITE8. How earthquake waves traverse layers of the Earth. From . 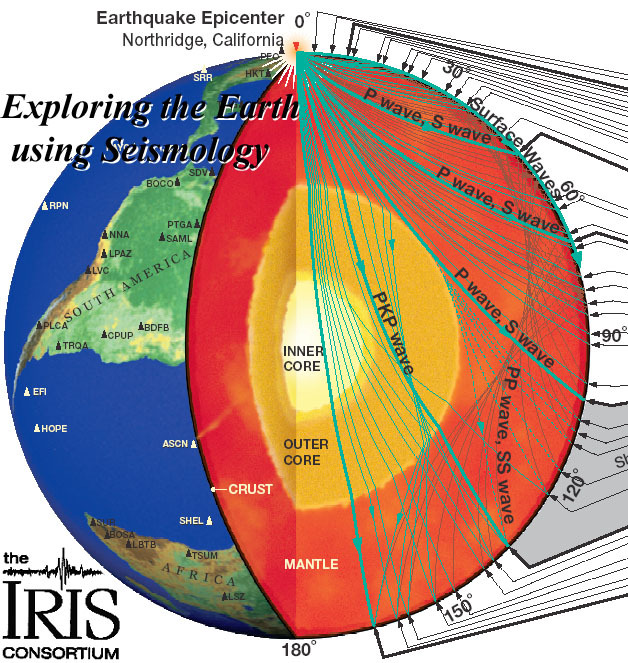 Seismology thus gives us some valuable information about the disposition of Earth's layers, with distances and thicknesses known to good accuracy. For more detail in this area, Purdue University have an excellent document up on the Web . Seismological analysis is carried out world-wide and is quite well-funded. Fig. ITE9. Ray-Path plots for seismic waves. From . How temperatures change with depth When it comes to looking at how temperatures change as you down deeper in the Earth, quite a lot is believed known. But apart from physical measurements in the parts of the crust we are able to reach, published values have necessarily been derived from calculations. These calculations of temperature values may often rely on assumptions, not always explicitly stated, and so their validity may depend on how good the assumptions are. Working from how quoted values vary from one source to another, it seems that their reliability is only reasonable. The same is true of pressures within the Earth. Figure ITE10. Two views of temperatures and pressures within the Earth. From  and . For example, suppose we compare the values for the temperature at the centre of the Earth given in these two figures and in the table in Figure ITE3 above. The table says 3000 degrees C, the figures say 5500 deg C and 'over 5000' deg C. The data in the table was compiled over 20 years ago, and so may not reflect recent work, but even so, all the quoted figures must be regarded as fairly unreliable. On the other hand, the values given for the depth of the Mantle/Mesolayer boundary agree at 2900 km, while the values for the Mesolayer/Core boundary are almost the same, at 5150 and 5100 km. These values, resulting from direct seismic wave measurements, can thus be seen as pretty reliable. Heat coming up from the deep Earth For any picture of the makeup and structure of the Earth to have credibility, it must be able to explain the flow of heat up to the surface from below. We know that heat does flow up from below, and we can measure it . Every day, about 213 BL units of heat energy flow out to the surface (1 BL Unit is equal to 4.28400 x 109 kWh or 1.54224 x 1016 joules). For comparison, all the energy used by Man is much less than half this, at 77 BL units, of which about 62 BL comes from fossil fuels. The energy the Earth gets from the Sun each day is hugely greater, at 1 million BL . So somehow, somewhere within the Earth, there is a source of heat energy which each day delivers to the surface an amount of energy greater than everything we currently control. What is this source, and where and how is it generated? This is an area still replete with controversy. Theories of the Earth's heat One of the first scientific suggestions was that this heat was left over from the early time of Earth's formation, when it was often assumed to have been molten. Back in the late 1800s, Lord Kelvin calculated an upper limit for the age of the Earth  by estimating how long it would take an earth-sized molten sphere to cool to today's temperatures. He obtained a maximum age near 100 million years. Some of his contemporaries argued for a maximum age as low as 10 million years. Either figure is very much less than Earth's well-evidenced age of about 4600 million years. The next suggestion was that the heat was being generated by the decay of radioactive materials within the Earth. The problem with this idea was there is no data to support it, we know nothing about whether there is any radioactive material beneath the Crust, or if there is, how much of it exists. The left-over heat and the radioactive-material ideas also both suffer from a major flaw. While there have undoubtedly been major changes in Earth's conditions since it was formed, evidence from sedimentary rocks shows that its surface temperatures have not varied wildly. Sedimentary rocks form in water, and liquid water exists only at temperatures around 0 to 100 deg C (there is variation with atmospheric pressure, but it's not large). Earth's oldest known sedimentary rocks, found in Greenland, are about 3900 million years old . So for most of its history, surface temperatures must have been within a range not too different to now. Figure ITE11. Earth's Oldest Sedimentary Rocks. From . Because radioactive materials have a half-life (time over which half their atoms decay after formation), even if they do contribute to Earth's heat, their influence must have dropped off considerably over the last 4600 million years. If their half-life was short, most would have already gone. If their half-life was long, their heating influence would be correspondingly small. Neither case gives rise to a steady heat flow. Then there is the matter of where the heat-producing process is situated. The favourite suggestion is, it's at the Centre of the Earth, and there have been some varied -- and often contradictory -- ideas of what goes on there. You can find a selection by googling "What produces the heat at Earth's centre?". Most of these answers are variations on the radioactive-decay or the heat-left-over ideas. Marvin Herndon has suggested that there is a nuclear reactor at the Centre, and that this is an 8-kilometre wide ball of Uranium . Following on recent results from the CERN Large Hadron Collider, even the presence of a huge block of Higgs Bosons has been suggested, though how this would lead to a regular heat source is not explained. Does the geothermal flux we observe at the surface really stem from a hot Core? I have analyzed this point elsewhere , and the conclusion is, "Not really". Here is a diagram from . Figure ITE12. Temperatures at depth within the Earth. Upper solid line: commonly quoted data; lower dashed line: typical temperature fall for linear conduction from a hot surface. From . Here is part of what  says about the temperature change curves. "Figure ITE12 shows (upper solid line) a plot of believed temperatures within the Earth against distance from the centre. The values may not be especially accurate, but at the moment they are the best we have. What do they imply? Close to the surface, the rate of temperature rise with depth is sharp, as much as 25 deg/km. Obviously this rate could not continue to the centre, else the temperature there would be 25 x 6370, some 160,000 deg C, instead of the 3000 deg commonly assumed. The figure also shows (lower dashed line) a typical curve for decrease in temperature due to linear conduction from a hot surface, the sort of curve that would be expected if the Earth's heat was being generated in some way at the centre. This curve is very different to the accepted-data one. What the upper curve implies is that the majority of the heat showing up in flow from below the surface is generated in the upper 100-200 km, which ties in well with the Type 2 Local Adjustment activities suggested above. If, in fact, temperatures continue to rise, at a much slower rate, in the levels below this, this ties in well with the Type 1 Parasolid Adjustment activities. Of course both heat sources are ultimately due, in EE theory, to expansion. The lesser Type 1 source is generated directly by the expansion process. Type 2 heating occurs by conversion of potential energy to heat, as higher land slumps into new rifts created by expansion, and by friction, as adjacent domains rub against each other. Heat flow data deserves more attention in the FE versus EE debate. It is worth noting that heat flow is virtually the same from continental and oceanic areas, though radioactive elements are believed concentrated in the continents." When the graph in Figure ITE12 was first released in 2004, it was a surprise for scientists and others interested in the Earth. Without using any new data, it more or less torpedoed the whole idea that Earth's heat was coming up from the Core. The article in which it was released also gave a firm footing to another surprising concept, the Expanding Earth Model, which describes how the Earth has been growing in size since far back in its history. It showed how expansion from within had led to descriptions such as Continental Drift, under which land masses seemed to have moved apart in geological times. But instead of these apparent movements being due to continents 'floating apart', or to 'tectonic plates' moving about in unexplained ways through mysterious forces, Expanding Earth shows how the land-masses were left behind as the Earth expanded under them, rather like pieces of furniture left in place as the carpet was pulled from under them. Much of the basic scientific work on Earth Expansion has been done by James Maxlow, who gained a PhD on this topic. 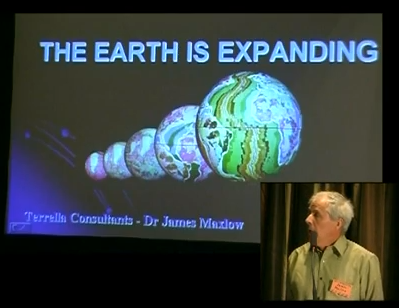 James has a series of 14 lectures about the Expanding Earth up on YouTube, at . Figure ITE13. James Maxlow lecturing. From . But although the Expanding Earth Model is now well established, it does not show the underlying reason why the Earth expands. For this, we need to delve deep down to the atom, and even beyond. About atoms and nuclei Everyone knows something about atoms -- how they are made up of a nucleus, containing protons and neutrons, and electrons, which form a cloud around the nucleus. And most are familiar with the idea that changes in the groupings of these particles, such as happens during radioactive decay, can lead to energy being emitted. It's also known that this energy comes from conversion of a very tiny part of the mass of the particles -- energy and mass are actually inter-convertible, according to the famous Einstein equation, E=Mc2. What's probably a less familiar idea is that the parts of an atom are held together by fields, which themselves contain energy. At this level, the distinction between mass and energy can become blurred, and the energy in a field of force can sometimes be treated as a particle. The early workers in this area, formally called Quantum Electrodynamics, had a reputation for giving quirky names to the things they dealt with. A Quark, the name given to one of the constituents of a nucleus, was taken from a James Joyce novel. The particles/forces which 'glue' together bits of atoms have been called 'Gluons'. About CES (Compression Energy Substance) To give a more readily comprehensible idea about what keeps atoms and their components together, let's imagine that there is a substance which does the sticking, and call it CES (for Compression Energy Substance). CES can be imagined as like an interwoven, tangled mass of tiny hollow elastic or rubber tubes, or a spongy substance with fibres running all through it. To pull bits of an atom apart, we would first need to stretch the CES, then to achieve full separation, we would need to sever the rubber tubes or fibres. The idea of CES is itself a model, but only a little one. As in all models, it is good only to the extent that it describes actual cases accurately, and is better to the extent that it can be used for prediction. In our CES theory, we might know the strength of the forces needed to break atoms apart, as we do know for real atoms. But there is little theory available about the volumes of the parts we will get if we achieve breakage. In looking at particular examples, though, it appears that a reaction which gives out energy from conversion of matter will lead to an increase in total volume of the resulting parts. That is, conversion of matter into energy will be accompanied by an increase in volume. There is a parallel here with how compressed gases behave. If we release the gas in an aerosol can and it expands, energy is extracted from the can and it becomes cooler. Now let's look at a real case. Our Sun, like most of the Universe, consists mostly of hydrogen. The energy which it produces to radiate out into the Solar System comes from combining hydrogen atoms together into heavier atoms. Hydrogen is the simplest possible atom, consisting of a single proton (positively charged) and an electron (a much tinier, negatively-charged entity). The first step in combining protons together is making deuterium, an isotope of hydrogen where the nucleus contains a neutron as well as the proton. This nucleus is called a deuteron. A deuteron has a mass very slightly less than that of the two hydrogen atoms which formed it (a neutron is essentially a proton combined with an electron), and it is this loss of mass to make energy which powers life on Earth. As an isotope of hydrogen, deuterium behaves chemically like ordinary hydrogen. When some of the hydrogen in water is replaced by deuterium, we get heavy water, and deuterium compounds are chemically just like hydrogen compounds. Because of the differences in mass, physical properties may be slightly different. All the above is well-known standard science, the masses and energies involved are established with great precision. We also know such things as the radii of a proton and of a deuteron. Figure ITE14. Proton and Deuteron Radii. From . Figure ITE14 shows values for these radii as set by the Committee on Data for Science and Technology (CODATA), established in 1966 as an interdisciplinary committee of the International Council for Science. These values are not in dispute. But look at one of the implications of them, an implication seldom mentioned. Even a cursory glance suggests that the volume of a deuteron is greater than the total volume of the two protons which make it up. Detailed calculations on the ratio of volumes have been done . They show that a deuteron has more than 7 times the volume of the two protons which make it up. Within the Sun, conversion of protons to deuterons is just one of the steps by which heavier nuclei, such as Helium, Carbon, and Oxygen, are built up, and little concern is due if the conversion causes the Sun to increase in size. But what if the conversion is taking place at the centre of the Earth? Neutron Stars Only one year after the neutron was discovered in 1933, Walter Baade and Fritz Zwicky proposed the existence of what was called a neutron star -- a star made up entirely of neutrons . They proposed that a neutron star is formed in a supernova. This is the same Fritz Zwicky who put forward fundamental views on red-shifting of light and on dark matter, as mentioned in my article  as supporting the view that the Universe is not expanding, and that dark matter is not a real entity. Baade and Zwicky correctly proposed at that time that the release of the gravitational binding energy [like CES] of the neutron stars powers the supernova: "In the supernova process, mass in bulk is annihilated". In 1965, Antony Hewish and Samuel Okoye discovered "an unusual source of high radio brightness temperature in the Crab Nebula" . This source turned out to be the Crab Nebula neutron star that resulted from the great supernova of 1054. Figure ITE15. Cross-section of neutron star. 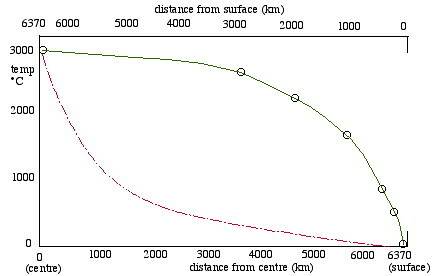 Densities are in terms of ρ0, the saturation nuclear matter density, where nucleons begin to touch. From . Here are some more extracts from the Wikipedia article on neutron stars . "A neutron star is a type of massive star, composed almost entirely of neutrons, which are subatomic particles without electrical charge and with slightly larger mass than protons. A typical neutron star has a mass between about 1 and 2 solar masses, with a corresponding radius of about 12 km. In contrast, the Sun's radius is about 60,000 times that. Neutron stars have overall densities which compare with the approximate density of an atomic nucleus. This density is approximately equivalent to the mass of a Boeing 747 compressed to the size of a small grain of sand, or the human population condensed to the size of a sugar cube. On the basis of current models, the matter at the surface of a neutron star is composed of ordinary atomic nuclei crushed into a solid lattice with a sea of electrons flowing through the gaps between them. It is possible that the nuclei at the surface are iron, due to iron's high binding energy per nucleon. It is also possible that heavy element cores, such as iron, simply sink beneath the surface, leaving only light nuclei like helium and hydrogen cores. The "atmosphere" of the star is hypothesized to be at most several micrometers thick, and its dynamic is fully controlled by the star's magnetic field. Below the atmosphere one encounters a solid "crust". Proceeding inward, one encounters nuclei with ever increasing numbers of neutrons; such nuclei would decay quickly on Earth, but are kept stable by tremendous pressures. The composition of the superdense matter in the core remains uncertain. One model describes the core as superfluid neutron-degenerate matter (mostly neutrons, with some protons and electrons). More exotic forms of matter are possible, including degenerate strange matter (containing strange quarks in addition to up and down quarks), matter containing high-energy pions and kaons in addition to neutrons, or ultra-dense quark-degenerate matter." The terms included towards the end of this quote are not intended to baffle readers, just to give the idea that stuff in neutron stars is possibly quite different to most of the Universe. Although they are exotic, their existence is now well established. At present, there are about 2000 known neutron stars in the Milky Way and the Magellanic Clouds, the majority of which have been detected as radio pulsars . It can be seen that neutron-star stuff is enormously more dense than anything else we know about (has very high CES). It has been calculated  that if all the matter in the Earth were in this form, the planet would be only 366 metres across. While very accurate figures are available for the radius of a proton or a deuteron, there are no such figures for a neutron. A neutron's radius depends on the conditions in which it is held, but may be very much less than the proton radius. A free neutron tends to decay into a proton and an electron. These two particles have positive and negative charge, respectively, and are held apart by an electric field. A neutron has no charge, and (perhaps because a field needs space) can be much smaller than a proton. In mass terms, the mass of a neutron is slightly greater than the sum of the masses of a proton and an electron. The difference is equal to the 'mass' (or CES) of the electric field. So what's at the Earth's Core? Finally we come to a logical answer to this question, one which explains how the Core can behave as a solid (though assumed hotter than the enclosing Mesolayer, which behaves as a liquid). 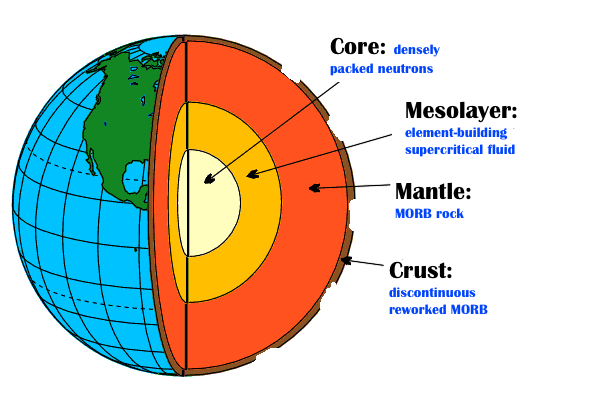 The Core holds matter in a different state to the rest of our planet, it is mostly compacted neutrons. Here then is one of the basic aspects of the Heartfire Model. 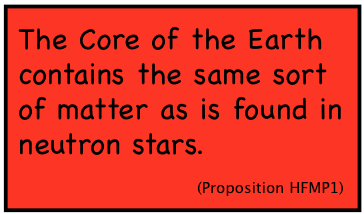 The Earth's Core contains the same sort of material as is found in neutron stars. The fire at our planet's heart is made of neutrons. It will be immediately seen that this Proposition explains most of the evidence on the Earth's structure and history as examined above. A super-dense Core, formed in the Earth's original aggregation over 4.6 billion years ago, could very easily give rise to the gradual release of energy and the expansion of the planet over this great age. There are some other things to think about regarding the Core. But let's move on now to look at the next layer up, the Mesolayer. 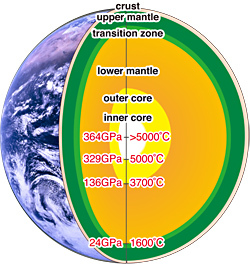 The Mesolayer (formerly Outer Core) It's pretty clear now that the interior of the Earth divides naturally into three layers, the Core, the Mesolayer, and the Mantle (with the Crust being the modified outer part of the Mantle). We've dealt with the Core. 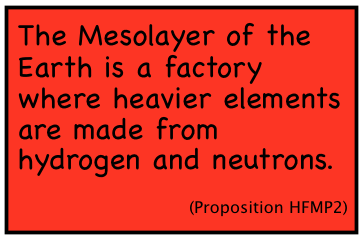 What is the nature of the layer above it, the Mesolayer? We know from seismic studies that the Mesolayer behaves as a liquid. It's fairly hot, and evidently under great pressure. In actual fact, the Mesolayer must be what's called a Supercritical Fluid . When liquids or gases are raised to high temperatures and pressures simultaneously, they attain a new condition of state which is neither liquid nor gas, but is subject to a new set of physical and chemical laws. This state is called a Supercritical Fluid. Figure ITE16. Carbon dioxide pressure-temperature phase diagram. From . Supercritical fluids can diffuse through solids like a gas, and dissolve materials like a liquid. Carbon dioxide does not exist as a liquid at atmospheric pressure, but if cooled sufficiently, it solidifies, to make 'dry ice'. At temperatures above about 30 deg C and pressure above 73 atmospheres, CO2 forms a liquid which is an excellent solvent. On the other hand, water, which normally is a very wide-ranging solvent, loses some of these abilities as a supercritical fluid. The details of this behaviour are not important here. The important thing to bear in mind is that, as a supercritical fluid, the substance of the Mesolayer cannot be expected to always behave as it would if unconfined on the Earth's surface. 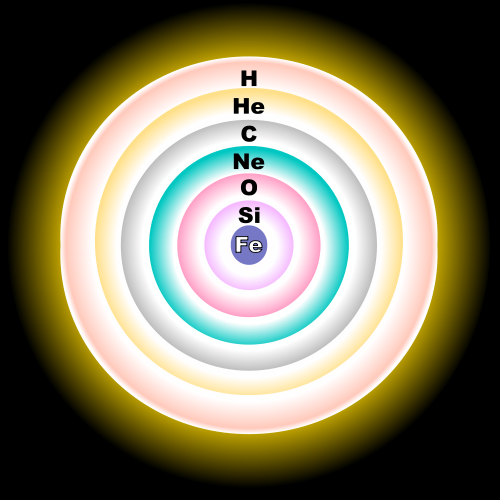 About heavy elements We are familiar with the idea that a star gets its energy from combining hydrogen atoms into nuclei of heavier elements, such as helium, carbon, and oxygen. Stars cannot use this process to make very heavy atoms. Different sorts of atoms contain different amounts of binding energy (like CES), and if you plot binding energy against atomic weight, you get a characteristic curve with a hump in the middle. Figure ITE17. 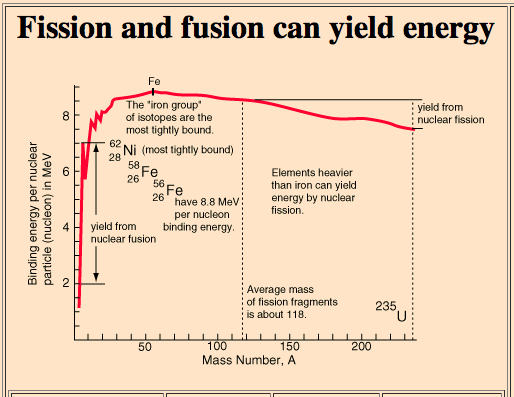 Fission and fusion can yield energy. From . Normal star processes can only produce elements as heavy as iron (Fe), using their processes of fusing atoms together. Human activities can so far only mimic the simplest of these processes on a large scale, fusing hydrogen together into heavier products, as on the left of the curve. This is the source of the energy in hydrogen bombs, and the target (so far not achieved) of producing nuclear energy from hydrogen to supply power utilities. We also know how to synthesize heavy elements on a laboratory scale, usually by bombarding nuclei of somewhat lighter elements with neutrons. In this way, tiny amounts of elements heavier than uranium, the heaviest natural element, can be made. All have very short half-lives, sometimes much less than a second. Figure ITE18. Postulated 'fusion shells' in a massive, evolved star just prior to core collapse. Not to scale. From . Figure ITE18 is a graphic of postulated 'fusion shells', produced in a star which has completed the process of generating elements up to iron (Fe). While only a graphic, and noted as 'not to scale', it does illustrate one of the fallacies often found in ideas about stellar and planetary objects -- that heavier elements will sink to the centre. In fact, even assuming that parts of a 'fluid' will somehow separate out by density, lighter items in fluids move towards zones of lesser gravity. But as gravitational forces decrease towards the centre of a star (zero at the centre), lighter items should migrate towards the centre of a star, rather than the surface. Only pressures are higher towards the centre. Present-day nuclear power stations get their energy from nuclear fission, using naturally-occurring elements on the right-hand side of the fusion/fission chart, such as uranium. These elements break down spontaneously, giving out energy (CES). Each isotope has its own well-defined half-life, the time that half a given mass of the element breaks down. The half-life of the most common isotope of uranium, U-238, is about 4500 million years -- very close to the believed age of the Earth itself. It is this isotope that is predominantly used in nuclear power stations. So if the usual star processes can only make elements as heavy as iron, what is the source in the Universe of heavier elements, like uranium? Making heavy elements -- Supernovas? Here is a question to which science is yet to provide a very satisfying answer. The usual explanation is that heavy elements are created during Supernova explosions. But if you google "Why do they think heavy elements come from supernovas? ", the explanations given, in my view, lack conviction. Supernovas are stars which explode dramatically, giving out huge amounts of energy over a short time, maybe a few weeks. We know quite a lot about them. Here are some extracts from the Wikipedia article . "Supernovas are extremely luminous and cause a burst of radiation that often briefly outshines an entire galaxy, before fading from view over several weeks or months. During this short interval a supernova can radiate as much energy as the Sun is expected to emit over its entire life span. The explosion expels much or all of a star's material at a velocity of up to 30,000 km/s (10% of the speed of light), driving a shock wave into the surrounding interstellar medium. This shock wave sweeps up an expanding shell of gas and dust called a supernova remnant. The word supernova was coined by Walter Baade and Fritz Zwicky in 1931. Supernovas can be triggered in one of two ways: by the sudden reignition of nuclear fusion in a degenerate star; or by the collapse of the core of a massive star. Alternatively a white dwarf star may accumulate sufficient material from a stellar companion to raise its core temperature enough to ignite carbon fusion, at which point it undergoes runaway nuclear fusion, completely disrupting it. Although no supernova has been observed in the Milky Way since 1604, supernova remnants indicate that on average the event occurs about once every 50 years in the Milky Way. They play a significant role in enriching the interstellar medium with higher mass elements." So when a supernova blows itself apart, the part blown out into space, the 'supernova remnant', is claimed to contain heavier elements. The part left behind is a neutron star, consisting almost entirely of neutrons. It's a logical deduction, then, that the star which exploded had a sphere of neutrons at its heart. It seems very possible that every star has a neutron core. This is not the accepted position, in fact there is no accepted position. If you google 'What's at the centre of the Sun? ', you will not find any definite answer. An associated Wikipedia article, "Supernova nucleosynthesis", deals with the source of heavy elements. "Supernovas are a key source of elements heavier than oxygen. These elements are produced by nuclear fusion (for iron-56 and lighter elements), and by nucleosynthesis during the supernova explosion for elements heavier than iron. Supernovas are the most likely, although not undisputed, candidate sites for the r-process, which is a rapid form of nucleosynthesis that occurs under conditions of high temperature and high density of neutrons. The reactions produce highly unstable nuclei that are rich in neutrons. These forms are unstable and rapidly beta decay into more stable forms. The r-process reaction, which is likely to occur in type II supernovae, produces about half of all the element abundance beyond iron, including plutonium and uranium. The only other major competing process for producing elements heavier than iron is the s-process in large, old red giant stars, which produces these elements much more slowly, and which cannot produce elements heavier than lead". What's dubious about the idea of supernovas making heavier elements? The conventional theory, then, is that elements heavier than iron are made during supernova explosions, through masses of neutrons impacting on the material ejected by the explosion. This ejected material is then spread through surrounding galactic areas. It's usually called interstellar gas and dust, and it is this material which supposedly aggregates together to form planets and solar systems. Although it is quite reasonable that heavy neutron bombardment will raise the atomic weights of nuclei hit by them, when you look at the supposed mechanisms and timings, it doesn't look so good. First off, all the transmutations involved would have to occur within the active period of the supernova, only a few weeks. Most of the element-forming processes in stars take place much more slowly, over millions to billions of years. Then there is the number of steps involved. The heaviest common isotope of iron has 84 nucleons (protons or neutrons) in its nucleus. The commonest isotope of uranium has 238 nucleons. Therefore, to make uranium from iron would involve at least 154 successful captures of neutrons for each nucleus. This, all over a period of a few weeks. How was the material to make Earth gathered together? According to conventional theory, the Earth and the rest of the Solar System was formed by aggregation of interstellar gas and dust. Most of the hydrogen went to the growing Sun, while the planets used up much of the non-gaseous dust. The outer 'gas-giant' planets also retained a lot of hydrogen, and its derivatives such as methane, in their atmospheres. There is scope for a radical revision of this picture , but that need not concern us here. Let's look at some of the implications of the current picture, using evidence from meteorites, solid rocky or metallic objects which fall to Earth from space. All the evidence supports the idea that meteorites were formed at the same time as the Earth, elsewhere within the developing Solar System, and chance collisions and orbital changes have since caused some of them to hit our planet. Meteorites vary very considerably in their nature and composition. Accurate methods have been developed to determine the ages of meteorites and rocks. The oldest-known meteorite to date is called the Allende Meteorite. This is believed to have broken up in Earth's atmosphere over Mexico, in February 1969. Figure ITE19. Section through an Allende meteorite. The cube on the right has 1-centimetre sides. From . 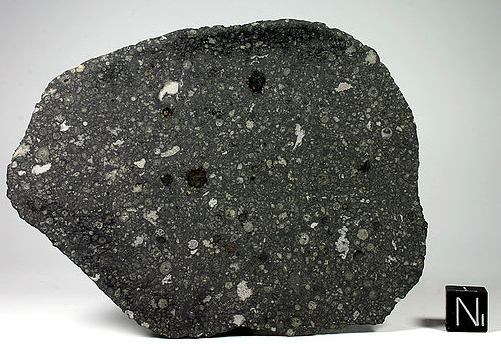 The Allende meteorite, a type called a carbonaceous chondrite, is notable for possessing abundant, large calcium-aluminium-rich inclusions [CAIs], which are among the oldest objects formed in the Solar System . Here is more from the Wikipedia article. "Allende contains chondrules and CAIs that are estimated to be 4.567 billion years old, the oldest known matter. This material is 30 million years older than the Earth and 287 million years older than the oldest rock known on Earth. Thus, the Allende meteorite has revealed information about conditions prevailing during the early formation of our solar system. The meteorite was formed from nebular dust and gas during the early formation of the solar system. It is a "stone" meteorite, as opposed to an "iron," or "stony iron," the other two general classes of meteorite. Most Allende stones are covered, in part or in whole, by a black, shiny crust created as the stone descended at great speed through the atmosphere as it was falling towards the earth from space. When an Allende stone is sawed into two pieces and the surface is polished, the structure in the interior can be examined. This reveals a dark matrix embedded throughout with mm-sized, lighter-colored chondrules, tiny stony spherules found only in meteorites and not in earth rock. Also seen are white inclusions, up to several cm in size, ranging in shape from spherical to highly irregular or "amoeboidal." These are known as calcium-aluminum-rich inclusions, so named because they are dominantly composed of calcium- and aluminum-rich silicate and oxide minerals. Like many chondrites, Allende is a breccia, and contains many dark-colored clasts or "dark inclusions" which have a chondritic structure that is distinct from the rest of the meteorite. Unlike many other chondrites, Allende is almost completely lacking in Fe-Ni metal." When you look at it, this evidence is totally in conflict with the idea that the Earth, and the other rocky bodies of the Solar System, formed from aggregating interstellar dust and gas originating from supernova explosions. How could such dust, necessarily fairly uniform in composition, come together to form a mixed pudding like the Allende meteor? How could all the material known on Earth or from space have the same age, of around 4.6 billion years? How could it all be derived from a single supernova explosion of this age? "We can have some confidence that these measurements are robust for the crust and upper mantle of the Earth, but less confidence that we know the abundance of uranium in the lower mantle and the outer and inner cores. While on average the abundance of uranium in meteorites is about 0.008 parts per million, the abundance of uranium in the Earth's 'primitive mantle' - prior to the extraction of the continental crust - is 0.021 ppm. Allowing for the extraction of a core-forming iron-nickel alloy with no uranium (because of the characteristic of uranium which makes it combine more readily with minerals in crustal rocks rather than iron-rich ones), this still represents a roughly twofold enrichment in the materials forming the proto-Earth compared with average meteoritic materials. The present-day abundance of uranium in the 'depleted' mantle exposed on the ocean floor is about 0.004 ppm. The continental crust, on the other hand, is relatively enriched in uranium at some 1.4 ppm. This represents a 70-fold enrichment compared with the primitive mantle. In fact, the uranium lost from the 'depleted' oceanic mantle is mostly sequestered in the continental crust". How can we reconcile these conflicting views? It's not new to suggest that both meteorites and other planetary bodies may have been subject to catastrophic processes in the past, even the break-up of a planet which once orbited in what is now the Asteroid Belt. It all becomes clearer if our model of Earth's structure assumes that the Mesolayer is a cauldron in which elements heavier than hydrogen are formed from hydrogen and the underlying neutron-packed core. The widely varied nature of meteorites is readily understandable if they are fragments or re-workings of larger planetary bodies with histories similar to that implied by the Heartfire Model. If a proto-planet broke apart catastrophically, material from its Mesolayer might well provide the wide variety of meteorite varieties, including types not found on Earth's surface. If the Mesolayer is, as suggested, a place where great pressures are applied to a supercritical fluid facing a neutron source, it could very conceivably generate MORB-like solid rock at its outer boundary. This Proposition on the Mesolayer, and the previous one on the Core, might at first sight seem rather wild, and based on insufficient evidence. But when you look at it, the Heartfire Model for the Earth fits in quite well with what we know about celestial bodies of every size and mass -- from supermassive black holes, down through the gamut of large and small stars, black dwarfs, hot jupiters, planets, moons, asteroids, meteors, and comets. Sizes of stars and planets It's generally accepted that stars of every size, and possibly planets and other objects found in space, are formed from the accumulation of dispersed matter -- interstellar gas and dust. The evolution and ultimate fate of each of these objects depends primarily on its mass. This mass may be gained by direct accumulation within a particular volume, or by merger or stealing from other objects. Figure ITE20. How stars evolve. From . Recent evidence from the Hubble Space Telescope and an array of other advanced astronomical instruments has given us a hugely improved picture of how stars and other space objects are born, evolve, and die. Generally, large mass accumulations form large stars which evolve quickly, the most massive stars having lifetimes as little as one million years. Many end up as supergiants which undergo a supernova explosion, leaving behind a neutron star. We saw above that these neutron stars are extremely dense. The fate of the most massive stars is to end up as black holes, which are far denser than even neutron stars. The condition of mass/energy within a black hole is presently a matter of speculation only. Smaller-mass stars, such as our Sun, have much longer lives -- the Sun is expected to reach twice its present age of around 5 billion years before ending up as a red giant, and then a white dwarf. White dwarfs are perhaps the smallest, least-energy emitting objects we think of as stars. If they fade completely, they may be called black dwarfs . Objects of even lower mass, less than that of a Sun-like star but more than that of a large planet like Jupiter, are called brown dwarfs. It appears that they are capable of nuclear fusion of hydrogen to deuterium, and in some cases lithium, and they do emit energy from these processes. Jupiter: "The Solar System's largest planet, Jupiter, radiates more energy into space than it receives from the Sun. The interior of Jupiter is hot: the core is probably about 20,000 K" . While the source of Jupiter's heat has been attributed to 'gravitational compression', it seems to me to be more likely that it holds a neutron core, as in the Heartfire Model. There is a common misconception regarding nuclear synthesis, that it requires very high temperatures. While high temperatures may well accompany synthesis, there is no special reason why this should be so, instead very high pressures acting on a fluid will suffice. In fact, high temperatures may act against synthesis, as they imply more rapid movement of the particles involved. The key to commercial exploitation of hydrogen fusion could well lie in ultra-high pressures applied at normal temperatures. If the Heartfire Model is valid for the Earth, it should also be applicable to the other planets. This is a major topic, dealt with elsewhere . But calculations by Kenny Chowdhary on changes in planetary density with increasing depth  do support the idea that all the planets are layered in similar fashion to the Earth. The calculations also give an explanation for the apparently anomalously high average density of our innermost planet, Mercury. 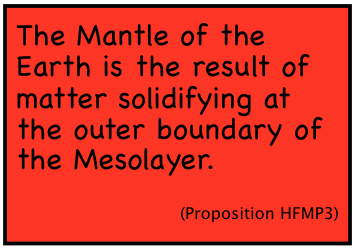 The Earth's Mantle In the Heartfire Model, the outermost major layer of the Earth, the Mantle, is the result of matter solidifying at the outer boundary of the Mesolayer. So in this model, the Mantle is essentially 'ordinary' rock, the result of the complex of reactions and element-building which has gone on in the Mesolayer. It has been progressively formed as the Earth has expanded during its long history, so its resulting composition may have varied during this time. But its outermost layer still in its original state is the Mid-Ocean Ridge Basalt or MORB which appears uniformly at the ocean-spreading sites. While the Mantle is nominally a solid in this model, it will have been subject to rearrangement as the Core and Mesolayer have expanded under it. The process and mechanism involved is not necessarily equivalent to liquid flow. In  the process has been called Parasolid Rearrangement. The Earth's Crust What we call the 'Crust' of the Earth, its outermost layer upon which we live, has very obviously been subjected to numerous changes during its long lifetime. Processes of weathering, erosion, sedimentation, chemical transformation, life processes, and melting have split up and reformed its original components into all the varied types of rock we find at the surface. The erosional and sedimentation processes have given us the sandstones, limestones, slates, and conglomerates which cover most of the land surface. Our great iron ore deposits are thought to result from chemical actions precipitating dissolved iron salts from ancient seas. Limestone formation involves precipitation of dissolved calcium salts. Coal, oil, and natural hydrocarbon gases are derived from fossilized remains of ancient life. The movement of domains, pieces and layers of the Crust moved around the surface by the expansion process as described in , has led to separation and concentration of valuable ores and minerals. The friction involved in these movements has led to local instances of great heat being generated, with thermal gradients and substance solution sieving out particular minerals, metals, and ore bodies into exploitable deposits. Friction from large-scale domain movements has given rise to volcanic chains which are often good sources of gold and other precious metals. The earthquakes which result from the planet's surface resettling itself after expansion may further refine precious-metal ores in a natural analogue to the industrial process of 'zone refining' (page 136 in ). The picture given above of the Earth expanding over the last 200 million years, to form the modern deep ocean beds, is apparently only the most obvious expression of an activity which has continued for all the Earth's life. James Maxlow's lectures on YouTube  show how the Crust has developed under expansion from much earlier times. The 200-million year milestone is more obvious to us because it marked a particular event. 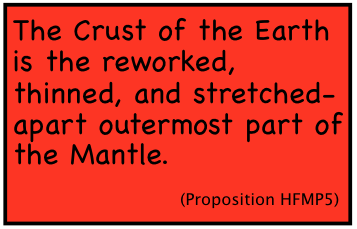 Before this milestone, the Crust had been reworked continuously and stretched out under expansion, but it still covered the whole of the planet's surface. But 200 million years ago, the stretching and thinning was enough to expose the underlying MORB for the first time. There is a possible check on the accuracy of this Proposition. We know the chemical components of MORB. We also have, from geochemical studies, estimates of the percentage occurrences of elements in the Crust as a whole. With due allowance for volatile components such as oxygen, nitrogen, and carbon compounds, there should be a match. Moreover, there may be a correlation between the abundance of particular isotopes and their binding energies as shown in Figure ITE17 -- the 'Fe peak' has the least binding energy (CES), and may be the endpoint of processes to minimize this. This might point to the reason why some meteorites are very rich in iron. Figure ITE21. The Heartfire Model of the structure of the Earth. Summing up The Heartfire Model developed here does seem to provide a new basis for understanding the structure of our planet. The model has also led to thoughts about bodies beyond the Earth. We might pick out a number of points, already mentioned in passing, which do accord with this model. 1. Neutron stars have massive magnetic fields. Earth's magnetic field could well originate in its neutron core. 2. The model explains the abundant presence of hydrogen, and its derivative water, at great depth in the Kola borehole. 3. The division of the Crust into SIAL and SIMA is a natural reflection of the SIAL being extensively reworked, while the SIMA is pristine. 4. The data on neutron stars shows that a huge mass of neutrons is capable of continued existence without any confining envelope. 5. 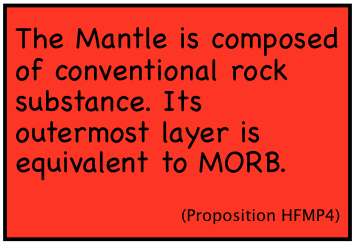 The model explains why MORB (Mid Ocean Ridge Basalt) is of the same composition, wherever sampled. Over to you Here is presented a scientific model, put forward for criticism and possible improvement or replacement. A link to comment on the work follows. 1. 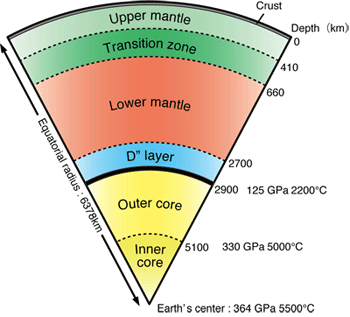 Earth Core Diagram. http://astroclock2010.files.wordpress.com/2010/04/earth_core_diagram.jpg . 2. 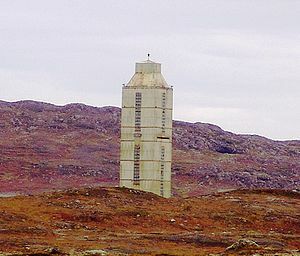 The Kola Superdeep Borehole. From: http://en.wikipedia.org/wiki/Kola_Superdeep_Boreholey . 3. David Noel. Nuteeriat: Nut Trees, the Expanding Earth, Rottnest Island, and All That .... Cornucopia Press, 1989. Online versions available at http://www.aoi.com.au/matrix/Nuteeriat.htm . 4. One Core At A Time -- Joides Resolution. http://joidesresolution.org/node/267 . 5. How Seafloor Spreading affects the level of oceans and seas - The Expansion Equilibration Model . http://www.aoi.com.au/bcw/Seafloor/index.htm . 6. Fire Under the Sea - Excerpts. http://www.youtube.com/watch?v=H7DPL0YYGL4&feature=related . 7. Paths of Seismic Waves from an Earthquake.. http://web.ics.purdue.edu/~braile/edumod/as1lessons/InterpSeis/InterpSeis_files/image015.gif . 8. Earthquake Waves. http://en.wikipedia.org/wiki/Earthquake_waves . 9. 3-D Earth Structure Model - Purdue University. web.ics.purdue.edu/~braile/edumod/.../InterpSeis.doc . 10. World's First Realization of Ultrahigh Pressure and Ultrahigh Temperature at the Earth's Center - Finally reaching the Earth's Core. http://www.spring8.or.jp/en/news_publications/research_highlights/no57_img/. 11. Scientists Recreate Ultra-High Pressure and Temperature of Innermost Earth. http://www.jamstec.go.jp/e/about/press_release/20100405/ . 12. David Noel. Temperatures of the Earth -- a globe in space. http://www.aoi.com.au/bcw/EarthTemp/index.htm . 13. John Woodmorappe. Lord Kelvin Revisited on the Young Age of the Earth. http://www.answersingenesis.org/articles/tj/v13/n1/kelvin. 14. Earth's Oldest Sedimentary Rocks. http://www.lpi.usra.edu/education/timeline/gallery/slide_21.htmla . 15. Brad Lemley. Nuclear Planet. http://discovermagazine.com/2002/aug/cover/ . 16. David Noel. Fixed-Earth and Expanding-Earth Theories -- Time for a Paradigm Shift? http://www.aoi.com.au/bcw/FixedorExpandingEarth.htm . 17. James Maxlow. Yes! The Earth Is Expanding Series of 14 video lectures. http://www.youtube.com/watch?v=_f6hcGJbjL0&feature=BFa&list=UUGD6AMdmiNRDWydTddY9U0A . 18. Wikipedia. Charge radius. http://en.wikipedia.org/wiki/Nuclear_size . 19. Heartfire Model Calculations. http://www.aoi.com.au/bcw/Heartfire/HeartfireCalcs.htm . 20. Neutron star. http://en.wikipedia.org/wiki/Neutron_stars . 21. David Noel. The Placid Universe Model - Why the Universe is NOT Expanding, or, The real origin of CMBR, Cosmic Microwave Background Radiation. http://www.aoi.com.au/bcw/Placid/index.htm . 22. How big is the nucleus? http://resources.schoolscience.co.uk/PPARC/16plus/partich1pg3.html . 24. Supercritical fluid. 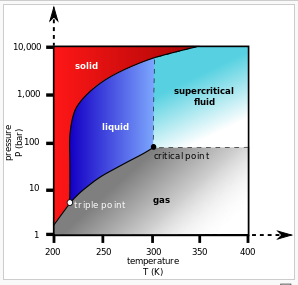 http://en.wikipedia.org/wiki/Supercritical_fluid . 25. Nuclear Binding Energy. http://hyperphysics.phy-astr.gsu.edu/hbase/nucene/nucbin.html . 27. Evolved star fusion shells. http://en.wikipedia.org/wiki/File:Evolved_star_fusion_shells.svg . 28. The Cosmic Origins of Uranium. http://www.world-nuclear.org/info/inf78.html . 29. Allende meteorite. http://en.wikipedia.org/wiki/Allende_meteorite . 30. David Noel. The Cosmic Smog Model For Solar System Formation. In preparation. 31. 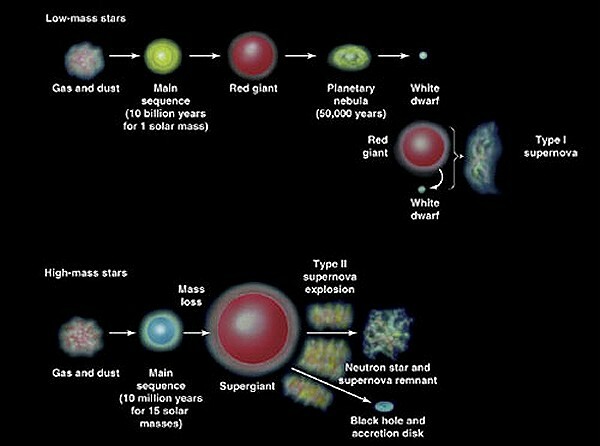 Stellar Evolution http://www.redorbit.com/education/reference_library/space_1/universe/2574776/stellar_evolution/ . 32. Brown dwarf. http://en.wikipedia.org/wiki/Brown_dwarfs . 34. David Noel. Internal Structures Of The Planets. In preparation. 35. Kenny Chowdhary. Masses and density gradients of planetary bodies. http://zombal.com/zomb/scientific-calculation/calculations-wanted-on-masses-and-density-gradients-of-planetary-bodies . Fixed-Earth and Expanding-Earth Theories -- Time for a Paradigm Shift? At: http://www.aoi.com.au/bcw/FixedorExpandingEarth.htm . Nuteeriat: Nut Trees, the Expanding Earth, Rottnest Island, and All That ... At: http://www.aoi.com.au/matrix/Nuteeriat.htm .